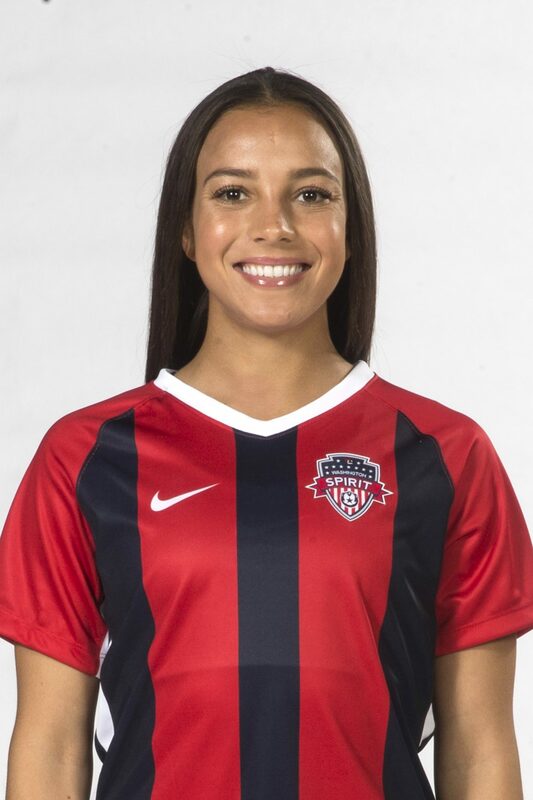 *Mallory Pugh was acquired by the Washington Spirit in May 2017 as part of the NWSL Distribution Process. 2018: Over the 2018 NWSL season, Pugh played in 15 games, starting 13, and contributed two goals and an assist. Pugh missed just over two months after sustaining a right knee injury in a game against the Houston Dash. After first making her return against Reign FC on August 8th, Pugh played in every game remaining in the season. 2017: During her breakout 2017 season in the National Women’s Soccer League, Pugh led the Spirit with six goals, also adding one assist, and was named as a finalist for NWSL Rookie of the Year… Appeared in her first pro game on May 20, 2017, at home against FC Kansas City, entering as a substitute in the 57th minute… Made her first career start the following week on May 27, 2017, on the road against FC Kansas City… Scored her first goal with the Spirit in the 69th minute of a 2-0 win over the Houston Dash on June 3, 2017, becoming the youngest scorer in NWSL history (19 years, 1 month and 4 days). Pugh was voted as the 2017 Washington Spirit Most Valuable Player. U.S. Women’s National Team: The youngest player in the U.S. Women’s National Team pool to make her debut in the last 11 years, she was called into the senior team for the first time for January Training Camp and made the game roster for the Jan. 23 matches vs. Ireland in San Diego … She then earned her first cap at 17 years and 269 days old, coming on for Alex Morgan in the 58th minute and then scored on a header off an assist from Christen Press, making her the 19th U.S. female player to score in their debut and the 6th youngest goal scorer in U.S. history … Was named the 2015 U.S. Soccer Young Female Player of the Year. In 2018, Pugh scored six goals in 13 appearances for the USWNT senior squad, including a brace against Denmark in January. 2016 Rio Olympics: On July 12, 2016, Pugh was named to the 18–player team that would represent the United States at the 2016 Olympic Games in Rio de Janeiro. She made her Olympic debut on August 3 in the team’s opening group match against New Zealand. On August 9, Pugh came in for Megan Rapinoe in the 33rd minute of the team’s final group match against Colombia. She scored in the 59th minute, becoming the youngest United States player to score a goal in the Olympics. She put the United States ahead 2–1 with her goal; however, the match ended in a 2–2 draw. Youth National Teams: The captain of the U.S. U-20 WNT that competed at the 2016 FIFA U-20 Women’s World Cup in Papua New Guinea…She was the Golden Ball winner (Best Player) and Golden Boot winner (Most Goals Scored) at the 2015 CONCACAF U-20 Women’s Championship in Honduras after leading the U.S. with seven goals and helping it win the regional title and qualify for the U-20 World Cup … A key player on the U.S. Under-17 Women’s National Team in 2013 and 2014 and was the leading scorer at the 2013 CONCACAF U-17 Women’s Championship with five goals and three assists, but the USA fell in a penalty kick shoot-out in the semifinal and did not qualify for the 2014 FIFA U-17 Women’s World Cup … Attended two U.S. Soccer U-14 I.D. camps in 2011 and one in 2012. First cap: Jan. 23, 2016 vs. the Republic of Ireland. First goal: Jan. 23, 2016 vs. the Republic of Ireland. The consensus top recruit in the nation for her class, she enrolled at UCLA in the winter of 2017 where she appeared in three spring games for the Bruins … Was named the 2014-15 Gatorade National Girls Soccer Player of the Year … She was the 2015 NSCAA Youth Girls National Player of the Year … She was the Colorado Sports Hall of Fame 2015 High School Female Athlete of the Year … The 2014 NSCAA Youth Girls National Player of the Year…Was a Sports Illustrated Kid of the Year Top-5 finalist.